DESCRIPTION: Length 12 - 15mm. 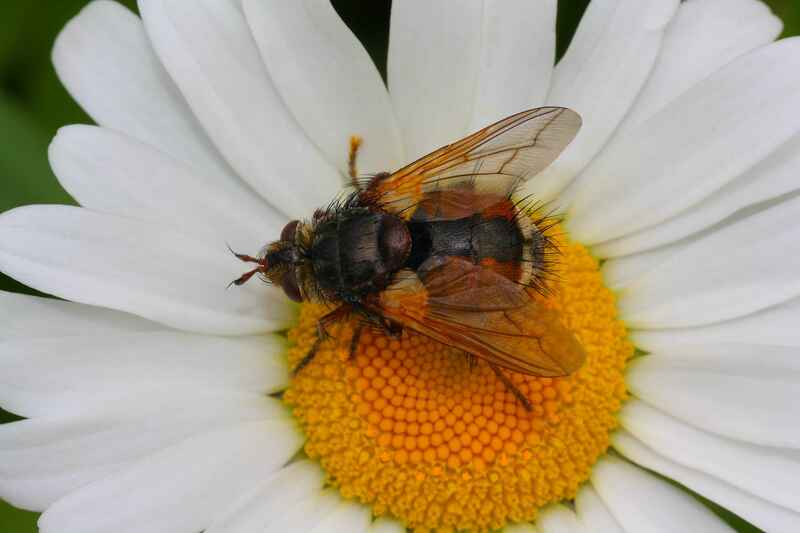 A striking fly that is at once recognisable by the large black abdomen that has brick coloured sides and a covering of long, black spiky hairs. The wings bases are obvious yellow, the legs are reddish and the hairs on the face are yellow. The thorax is also black and quite spiky. BEHAVIOUR: Often seen feeding on Umbellifers and other waterside vegetation. A parasite of various caterpillars in the Noctuid family of moths. DISTRIBUTION: Frequent throughout Britain. HABITAT: Near to damp areas and lush vegetation. PERIOD: April to September.